There has been a significant amount of attention brought to head and brain injuries recently. These have become a focus of the healthcare community due to their serious nature and their ability to impact patients and their families. Anyone who has dealt with a traumatic brain injury understands the significant impacts it can have on a patient’s quality of life. For this reason, it is important for everyone to understand the basics of traumatic brain injuries. Hypoxia: Hypoxia is an often overlooked cause of a traumatic brain injury. Someone who goes without oxygen for even a few minutes could suffer severe brain damage. This could result from poor circulation to the brain or from lack of oxygen in the bloodstream, such as with drowning. Motor Vehicle Accidents: People can suffer a direct blow to the head in any type of auto accident. Whether it’s a motorcyclist falling from their bike or a truck accident where someone’s head strikes the dashboard, motor vehicle accidents can cause significant neurological trauma. Bicycle Accidents: Of course, bicyclists can suffer accidents as well. Sometimes, they have to swerve out of the way of a vehicle who came too close. Other times, they might get struck by a car and land on the pavement. Even though most cyclists know to wear a helmet, extreme force could still lead to severe symptoms of traumatic brain injuries. Bleeding: Imaging scans are needed to check for bleeding in the patient’s brain. If bleeding is present, it is filling the enclosed space of the skull. This could lead to increased levels of intracranial pressure, possibly causing herniation. Intervention must be performed immediately before this happens. 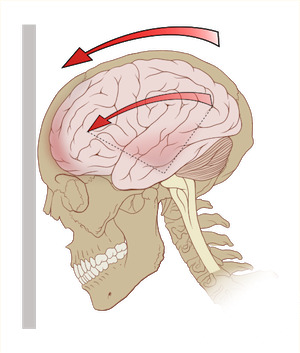 Swelling: As with most injured tissues, the brain will swell in response to any severe injury. This is a result of cells flowing through the vessels to the injury location as they start the repair process. Unfortunately, swelling also raises intracranial pressure, just as bleeding does. Nerve Damage: Imaging can also be used to grade diffuse axonal injury. This injury results from strong rotational forces that can cause the nerves to sheer. This type of damage lights up in a unique fashion on scans and can help the physician localize the area of injury. Surgical Costs: If a patient requires surgery, the family could still be on the hook for the deductible or coinsurance. Rehabilitation Costs: Because of the chronic nature of brain injuries, most patients require significant rehab upon discharge. Some insurance companies do not cover this. Lost Income: If patients cannot return to work after suffering a head injury, the lack of income could place a family under significant financial pressure. If a patient has been injured due to the negligence of another party, they should be held accountable for their actions. An experienced Rio Linda brain injury lawyer can not only negotiate with insurance companies to receive a beneficial payout but also make sure that the other party is held accountable. They will even take the case to court if necessary. Rely on the experience of a professional to bring about a just outcome. I’m Ed Smith, a Rio Linda Brain Injury Lawyer. Physicians will rely on imaging scans to both diagnose a head injury and rate its severity. If you or someone you care about has suffered neurological trauma, please contact my office today at 916.921.6400 for friendly, free advice. I am a proud partner in the California Chapter of the Million Dollar Advocates Forum. Every injury lawyer of this group has obtained verdicts and settlements of over $1 Million Dollars. Take a moment to look at some of my verdicts & settlements. You may also look up some of my client reviews by following these three links: Avvo, Yelp, and Google.